The moon comes closest to the Earth for all of this month on March 28, 2010, at 5 hours Universal Time. 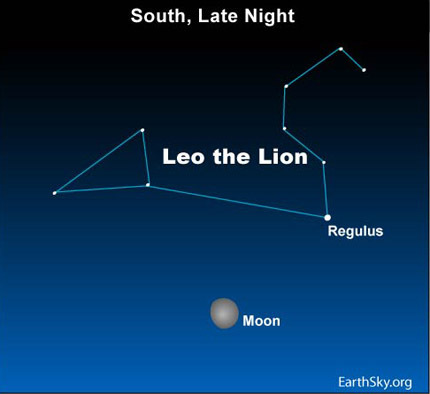 For the central US, that puts the moon’s closest approach at 0 hours Central Time on March 28. The designation 0 hours on March 28 means midnight March 27-28. In other words, that is midnight tonight Central Time. At this magic hour, the waxing gibbous moon will be 361,876 kilometers (224,861 miles) distant. Contrast this with the moon’s distance of 406,008 kilometers (252,282 miles) when it was farthest away for the month on March 12, 2010. It is called apogee when the moon is farthest away and perigee when it is closest. Apogee or perigee refers to the distance from the centers of the Earth and moon. Depending on where you live on the Earth’s surface, you may be closer or farther away from the moon than the moon’s actual perigee distance. When the moon is out, it is nearest to us when it’s high overhead, but most distant when it is rising or setting. In the US, the moon shines respectably high at the moment of perigee tonight.